From fluffy pancakes to melty chocolate sandwiches, here are 11 terrific foods that can be shaped into hearts for Valentine's Day. Make Valentine's Day cupcakes even cuter with this brilliant Mad Genius Tip for forming them into hearts. Serve heart-shaped pancakes in bed with this mess-free technique. Try April Bloomfield's exquisite ricotta pancakes or these fluffy blueberry-banana ones. It's easy enough to shape pizza dough, but you'll get extra points for cutting heart-shaped pepperonis like F&W Instagram follower Krys Melo (@melodramablog). 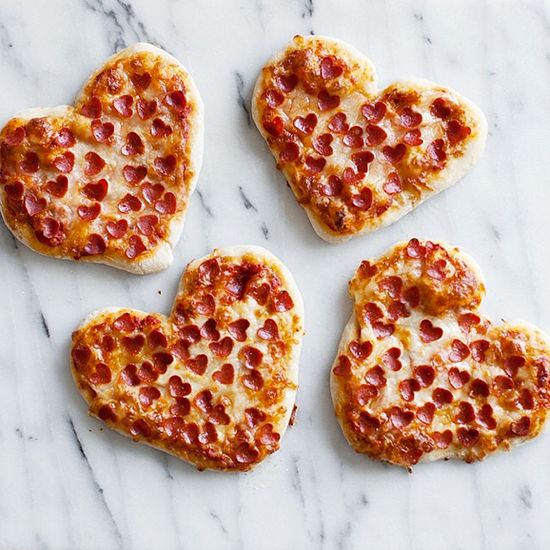 Or get some heart-shaped marshmallows to top a sweet heart-shaped s'mores pizza. While you can never go wrong with heart-shaped chocolate chip cookies, you can also use a cookie cutter to make these lightly spiced oatmeal cookies for a decadent heart-shaped ice cream sandwich. Cut bread into a heart with this cutter (or a knife). Top it with a spicy, Mexican-inspired sauce and avocado mash or use a heart-shaped mold for fried eggs. Make DIY heart-shaped chocolates with just a pan of brown sugar, a sheet of plastic wrap and everyday kitchen items. Or use a heart-shaped cookie cutter to make Jacques Pépin's incredible fruit jellies. From warm chocolate cake to luscious caramel salted cheesecake, heart-shaped ramekins will take dessert to another level. Twist pretzel dough into a heart shape for a loved-up snack. Make these delicious, easy ravioli more romantic by shaping them into hearts with an aluminum cutter. The bread mold cutter (see No. 4) is also great for everything from gooey grilled cheese to chocolatey sandwiches with caramel sauce. Upgrade brownies for your valentine by making super-cute miniature ones with a petite heart mold.